It was a disappointing day for the UMass women’s and men’s cross country teams this past Saturday at the Atlantic 10 cross country championships in Mechanicsville, Virginia, with each group falling short of their expectations coming into their first postseason race. The women’s team placed 13th out of 14 teams, while the men placed sixth but were viewed as a favorite coming into the race. Dayton won its third straight conference title for the men’s championships, while Richmond walked away victorious with the women’s title. “It just seems like anything that could go wrong, did [go wrong] this season,” said UMass women’s coach Julie LaFreniere. LaFreniere knew it would be a down year after graduating her top two distance runners from last year, including All-American Heather MacLean, but a cluster of medical conditions seriously hindered the Minutewomen’s campaign. Two of the Minutewomen’s top athletes — Caroline Clark and Serena Sarage — have each been battling anemia for the latter of the season, while freshman Samantha Schwers was expected to be a one of the best runners for UMass, but has had pneumonia since August. 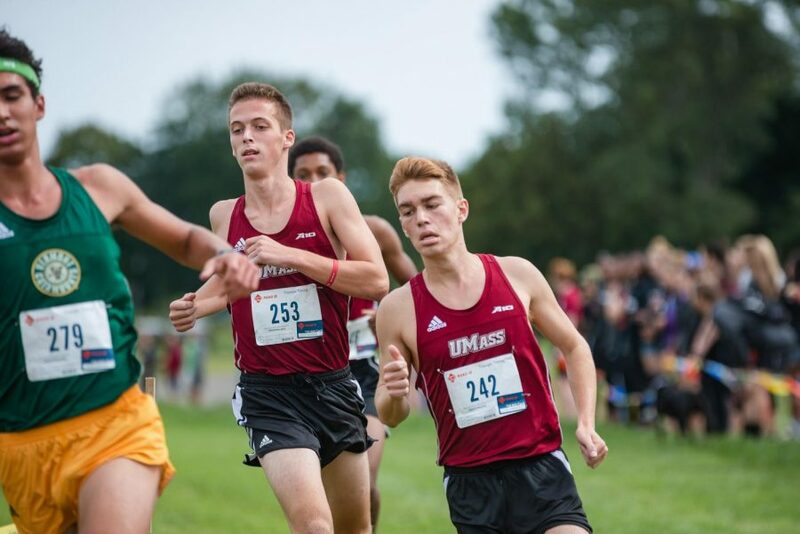 UMass placed just three runners in the top 100 and only one in the top 40. Colette O’Leary placed 36th in 18:20 on the five-kilometer course, while freshman Alexina Hurley (18:54) and Junior Taylor Blow (19:17) finished 69th and 86th. For the Minutemen, Saturday was also a tough pill to swallow after building up momentum by winning the New England Championships just two weeks prior. Coaches and athletes each expected to make a run at the conference title, but an injury to one of their top five runners and solid performances by conference powerhouses proved to be too much for the Minutemen. Despite the result, UMass coach Tim Ritchie stayed optimistic and was able to find several silver linings from the meet at Pole Green Park. Famiglietti ran a strong and consistent 10k race in which he was 14th through the 1.6-kilometer mark, 11th at the 6.4 and finished 13th overall. It is also the first time this year that the Massachusetts native has been the top finisher for the Minutemen. Josh Rahn ran the second-best time of any freshman on Saturday, completing the course in 25:36 for 26th place. He was just under three seconds behind teammate Dawson Bathgate (25:33), who placed 20th overall. Other notable performances for the Minutemen were Kendall Westhoff (25:43), Michael McDonald (25:54), Erik Engstrom (26:10) and Nasir Gibson (26:25), who all placed in the top 100 for the Minutemen. Next Friday, UMass will travel to Buffalo, New York for the NCAA Northeast Regional Championships at Audubon Golf Course, where it will be the final race of the 2018 campaign for the Minutewomen and the penultimate meet for the men’s team. The women will take on a six-kilometer distance first at 11 a.m. on November 11th, while the men take on a 10-kilometer course at noon. The meet will feature regional powerhouses such as Syracuse, Providence, Iona and Boston College.